We left Vienna yesterday morning. We went back to the airport picked up a rental car and zoomed off towards Salzburg. We are no different from other tourists who have done this because we stopped in the village of Melk where there is an impressively large monastery. We toured the monastery and grounds. We were impressed with the library with its musty smell of old books. We also came into the church as a noon service was in progress and we were properly blasted by the pipe organ. It rumbled right through your chest and had a marvelous sound. 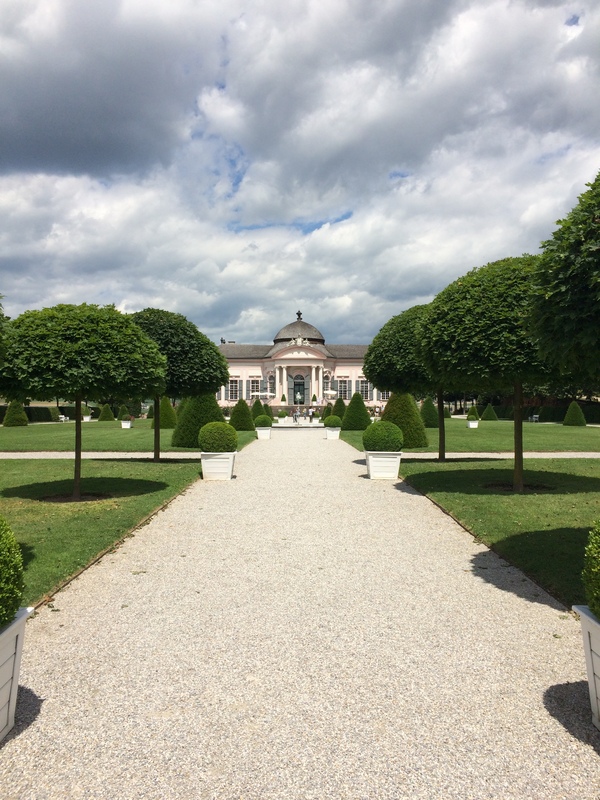 After our tour we went in to the gardens, had a drink in the pavilion, walked through the dappled shade and viewed the Danube’s lazy progression down stream. 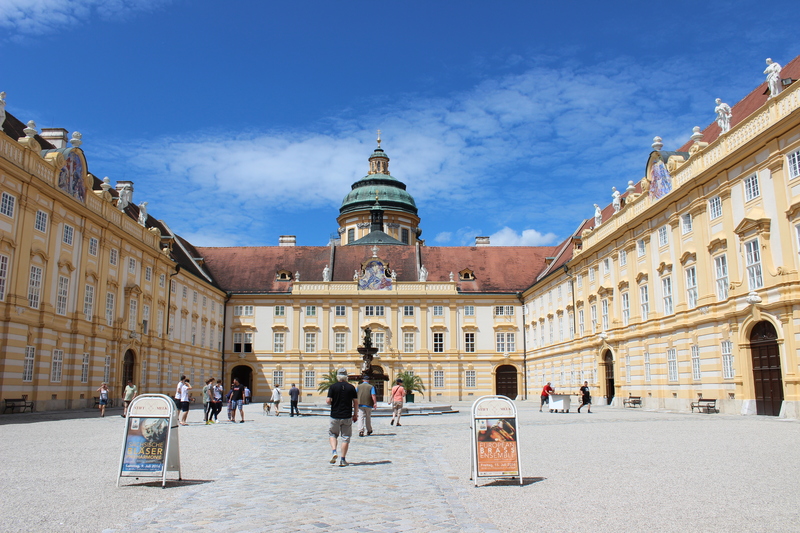 Afterwards we walked down to the town of Melk and looked around a little bit. We tasted schnapps – hazelnut and bought a bottle. We’ll see if it makes it back to Florida. After climbing the big hill back to the car we continued on towards Salzburg. We arrived in the late afternoon, and thanks to the GPS, found our hotel easily. After checking in we laid down for a bit (we were tired) and awoke with surprise around 7 p.m. Even though we were still tired we needed to eat and decided to drive into town (we are staying on the outskirts) and find someplace for our supper. 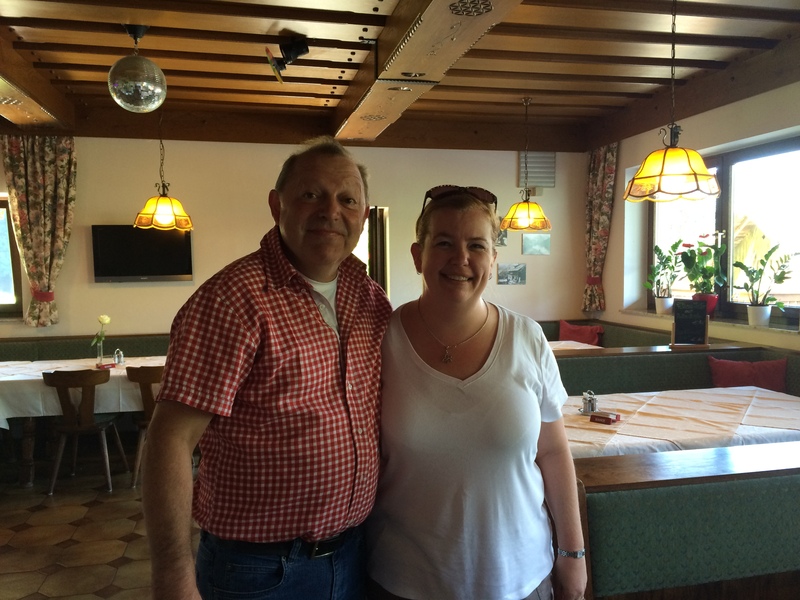 We found an ideal little place: Zum Wilden Mann. It was decidedly cute, had good hearty food and of course, beer. We properly filled our gullets and then took an evening constitutional around the city streets. We saw Mozart’s birthplace and the fanciest McDonald’s sign I’ve ever seen. 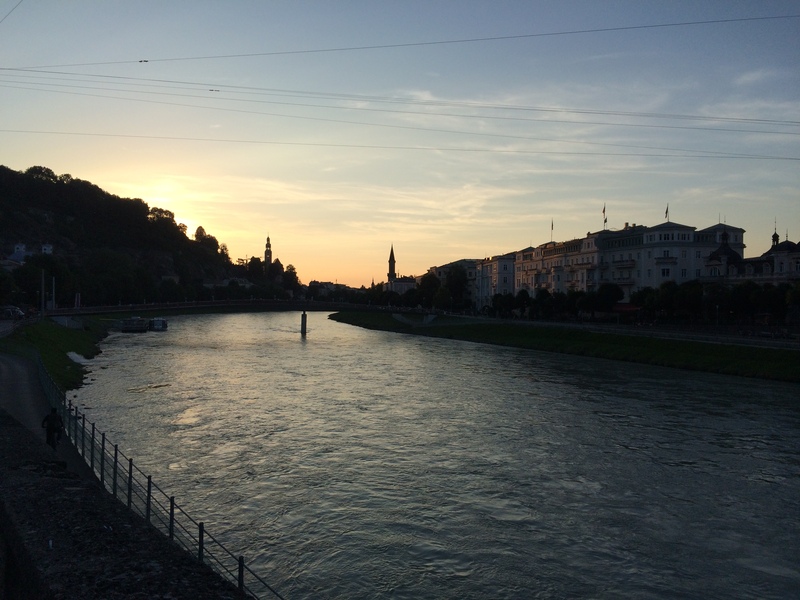 The sun was setting, the light on the Salzach River was lovely, and the air was cool. It was a bit of heaven. My wild man at Zum Wilder Mann. Today we set out by 8 a.m. towards a town about 40 km south of Salzburg called Werfen. It is home to the largest ice cave in Europe and also boasts a well-kept medieval castle called Burg Hohenwerfen. But first things first. We needed breakfast because we just hadn’t eaten enough the night before. On our way up the mountain to the ice cave we stopped at a little guesthouse/restaurant. We were the only two folks in there while we dined on fresh baked rolls, cheese and jam with excellent coffee. Our host, a gingham-bedecked man named Casper plunked himself down at our table when we finished eating and we tried to make conversation between his broken English and my broken German. He was a friendly cuss and we laughed at our miserable attempts at conversation. Me and Casper the friendly Austrian. Up, up, up the road we went to the ice cave. 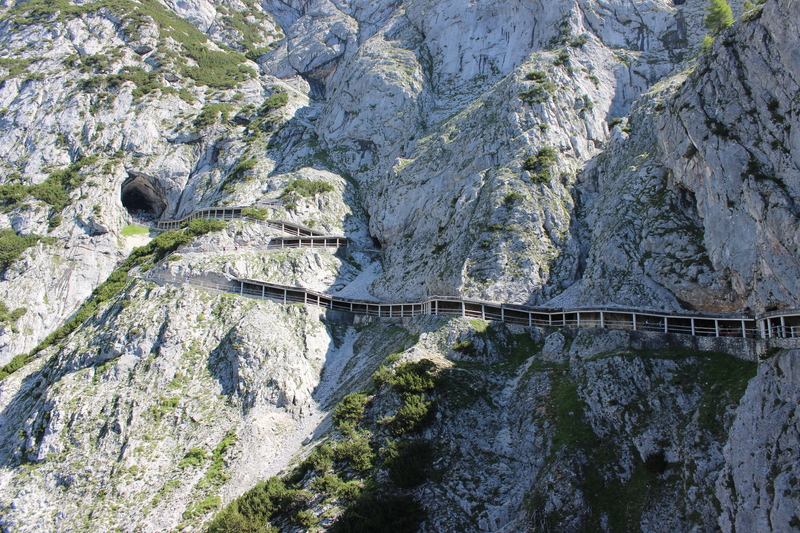 Kosta had read about it online and it said that the trail was a little tough: first a twenty minute climb through the woods, a three-minute cable car ride, and then another twenty minute climb to get you to the entrance of the cave. It was a slog, especially for the two of us who haven’t been working out as we should. But we made it, panting, to the mouth of the cave, donned our sweatshirts and waited for the tour to begin. The road to the mouth of hell. Dante Alighieri would concur. Obviously, Johannes is one of the devil’s tour guides. Kosta says the reason why they don’t let you take pictures in the cave is so there is no photographic evidence of all the people trudging up endless risers, heads down, not speaking, only the soft noise of labored breath and whimpers for the end can be heard. Did you know that Dante pictured the lowest circle of hell as a frozen lake of ice? The thought was present as I held my gas lantern and ascended through an icy landscape in the dark, not knowing when it was going to end. The ice cave was beautiful. It was cold, it was impressive. I am glad I saw it but I am never, ever doing that again. When we found ourselves blinking in the sun again we were both surprised to be alive. Then we had to walk back down the hill on gelatinous legs, wait for the cable car, walk down the other set of switchbacks until we got to the entrance. I had to pee but the WC was down another flight of stairs and I wasn’t sure I would be able to make it back up again. I skipped it and we drove away, our innocence of just a few hours before shattered like a falling icicle. Now, let me tell you about Burg Hohenwerfen. If you know my husband at all, you know his favorite movie is 1968’s Where Eagles Dare starring Richard Burton and Clint Eastwood. It’s a thrilling movie. The plot centers on several WWII special agents sent to raid a castle deep in German territory to liberate a crucial prisoner. There are secret plots, murder, treachery, and a nail-biting fight scene on top of a cable car. 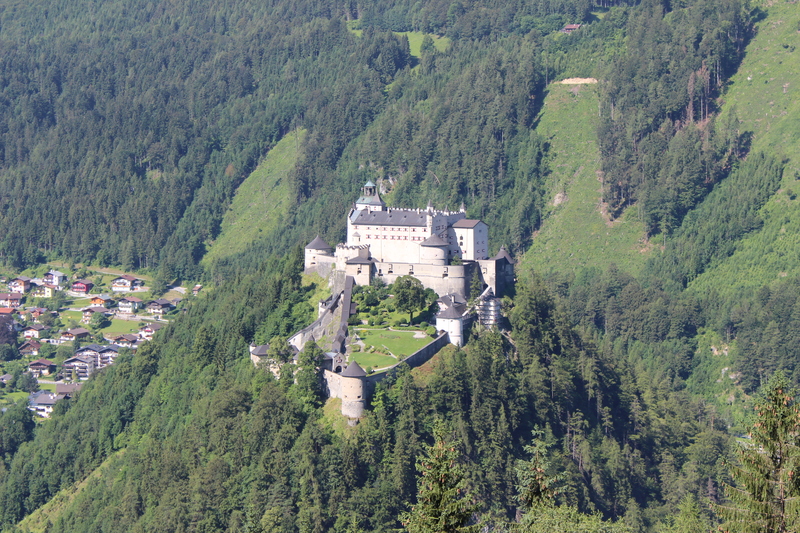 Burg Hohenwerfen, or the Schloss Adler. 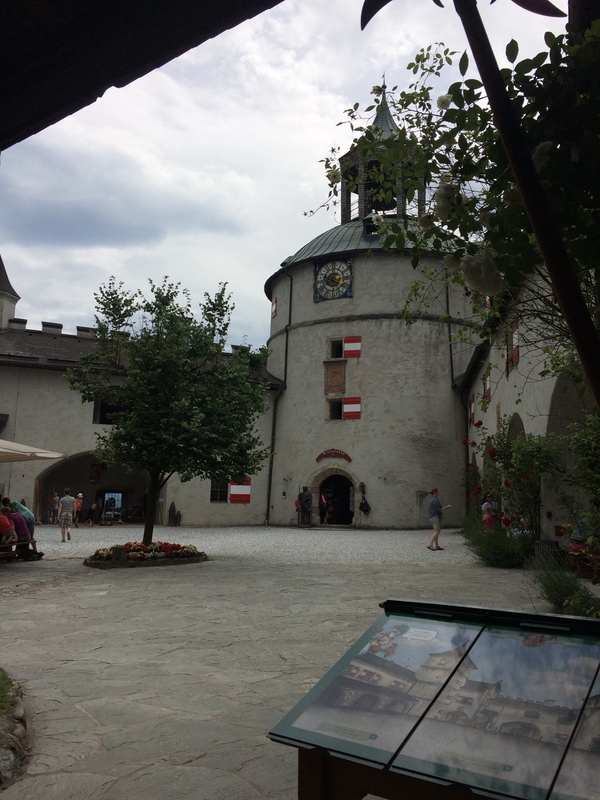 The castle in the movie, the Schloss Adler, is none other than Burg Hohenwerfen. It was a dream come to life for my husband. While we were there he pulled out his iPod (yes, he still has an iPod) and listened to the soundtrack while looking around with the ecstasy of a 12 year-old boy. It was pretty adorable. We did take an interesting tour of the place, though had to skip the falconry show, as it took place on a steep incline and we didn’t think our legs would make it. But we did climb all the way up to the bell tower and down again. Somehow. Through sheer iron will, I believe, because there was no muscle left in my legs. 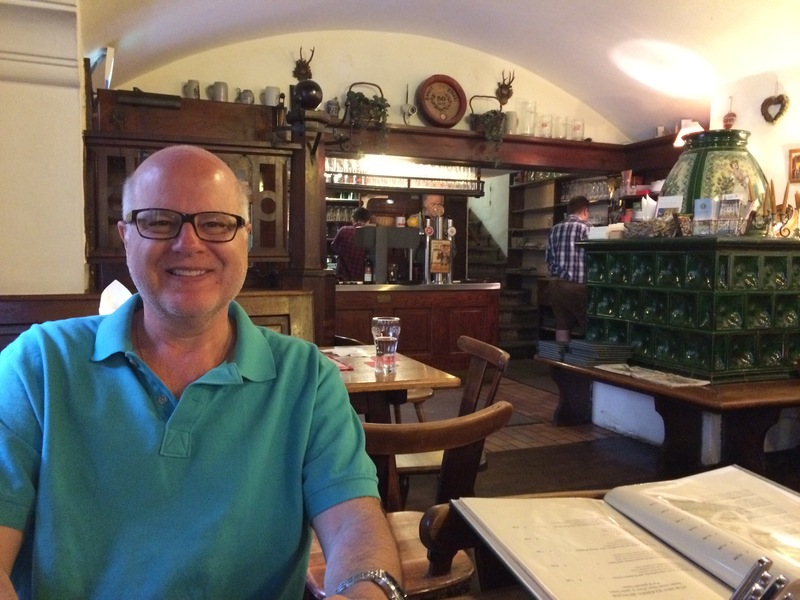 After our tour we went down to the village of Werfen and had a beer at a cafe, and laughed in the way people in shock do about something traumatic that has just happened to them. We still can’t believe there wasn’t more warning about how strenuous the tour at the ice cave was. If it had been America (and I’m glad it isn’t) there would have been a lawyer at every switchback, handing out his card and pointing to the warning signs. We are back at the hotel now, barely moving, groaning, and wondering what will become of us tomorrow. Pray for us. We will need it. ← Guest Post: What… no Brahms?! My legs are having sympathy cramps for you. Remember when we walked up those steps in the tube? I thought I was gonna die. I think there were 100 steps or something. We’re enjoying your blog so much! Stay safe and keep your eyes peeled for the Franceseseseseses. This is kind of sad but I am so glad you write your blog otherwise we probably would have very little communication. I enjoy so much reading about the trials and tribulations (“whatever all that junk is” as referred to by The Beaver)of you daily life and exploits. Your Uncle and I never really got to know Kosta very well but from the times we have been around him and from your posts and picts we know we would love him (and we do)! Every time I see a pict of him I have to laugh because it seems like he is doing something crazy or has that adorable grin on his face. I told Ken his sense of humor reminds me a lot of your Dad and that is a very good thing. You both look so happy together and that is the main thing. Anyhow, keep posting the great picts as I look forward to seeing them everyday. Boy would Grandma Eileen ever love them as well!!! Oh and also, next trip be sure to pack some Epsom Salts:):):) Have (more) fun and continue to be safe. Love you guyz!